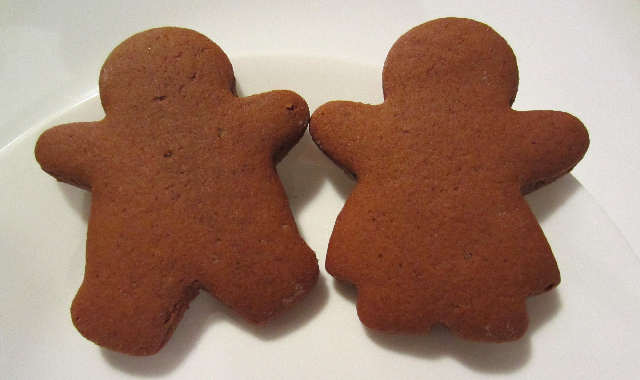 This recipe comes from my cousin, who makes the best Gingerbread cookies I've ever had. The recipe apparently originated from the Betty Crocker cookbook, but I'm going to pretend that she came up with it herself :). Before this past weekend I had never made gingerbread cookies before. Never. I just kind of expect them to be around during Christmas and so never think to make them (until it's too late) and though I would still enjoy them in June, I'm not sure others would. Here's another confession, I don't think I have ever used molasses in anything, and as a result, don't know a thing about it. This recipe called for "dark molasses," which does not exist at my grocery store. In fact, I'm not entirely sure what it is. Some quick googling couldn't resolve my issue either. It seems that no company makes any product called "dark molasses." So, as I was staring at Fancy and Cooking Molasses in the baking aisle, I figured that the recipe must be leaning towards the cooking molasses. After all, it has a "more robust flavour." I should also note that I bought these ingredients the week before I actually made the cookies and never actually checked if I had made the right decision (that's just how I roll). As I was putting the recipe together I gave the molasses a taste, it was quite bitter; face scrunching-ly bitter, with little to no sweetness. All I could taste was barbecue sauce. However, I figured it would be better once mixed with everything else. I tried the dough before putting it in the fridge and I wasn't sure how much better it was. After the two hour wait was up, I took the dough out, once again gave it a taste, and thought it tasted better, but wasn't sure if I was losing my mind at that point. Regardless I started rolling out dough and cutting out gingerbread people (men and women, I'm an equal opportunity cookie eater). I started out making bigger cookies, but eventually switched to smaller ones. It was slightly more work but I like being able to eat more and not feel like a troll. And there were a lot of cookies, over a 100. I ended up freezing about 3 dozen of them. As they came out of the oven and cooled I gave tastes here and there. They weren't horrible, but the molasses flavour was quite powerful. I wasn't sure if I liked it, and was pretty sure that I had screwed it up. This recipe makes a lot of cookies. The original recipe says 2 1/2 dozen 2 1/2 inch cookies, but I don't see how that's possible. I made smaller cookies but ended up with 100+ for the full recipe and 5 dozen for a half recipe. My cookies were about 2 inches by 1.5 inches if not larger. When my brother and his girlfriend arrived at my place later that night for Chinese food and Batman, I had them try the cookies as well. The look my brother gave me was all I needed to know; his girlfriend just said that they could be sweeter, but that they would probably go okay with coffee. Saying something half decent about the cookies also meant that she would be sent home with some. My parents after trying them, said something similar, not bad, but I could tell they didn't like them anymore then I did. The next day I was curious to see how the cookies tasted. Hoping that the ginger flavours, and the sweetness were more pronounced after an overnight rest. Instead I tasted a cookie that would have been better ground up and sprinkled on steak, absolutely disgusting; an abomination. I grabbed all the containers of cookies and proceeded to toss them all in the garbage. I was mortified that my brother's girlfriend had taken some home, and as a result her parents were probably eating them (I have a reputation to uphold). I refused to be defeated though, and Sunday morning I got up early, went to the grocery store, bought the fancy molasses and did it all over again. Although this time I only made a half recipe. If disaster struck again I didn't want to waste so much flour. This time the cookies were good, great. Terrific ginger flavour, with all those warming spices to go with it. And the molasses was where it should be, in the background and a little to the left :). My only complaint was that I managed to slightly overbake them, (slightly is a relative term) mistakingly keeping them in the oven between 12 and 15 minutes, rather than 10 to 12. As a result, they were kind of tough after the first day. And now they've turned out perfect, crispy at the edges, and soft everywhere else; the flavours are warming, balanced, and never overpowering. You might very quickly find yourself eating them one after the other. I really do love these cookies. In a small bowl whisk together baking soda, ginger, salt, allspice, cloves, and cinnamon. In a large bowl add shortening and brown sugar and whisk until smooth. Add molasses and water and whisk until completely combined. Add spices to molasses mixture and whisk until completely combined. Add flour and fold in until no streaks remain (be sure to get it all). If you need to, you can knead the dough a bit as well. Allow to chill in fridge for at least 2 hours. Preheat oven to 350F and lightly grease cookie sheets. Once chilled, roll out dough to 1/4 inch thickness on a lightly floured surface. Cut out cookies with floured cookie cutters. Place cookies on cookie sheet approx 2 inches apart and bake for 10 to 12 minutes or until an indentation with your finger begins to spring back when touched. Allow to cool on cookie sheet for about 5 minutes before moving to rack to cool completely (don't move the cookies until edges have firmed up). **Side bar: these cookies seem temperamental about the amount of flour used. After chilling, the dough barely holds together. The first two times I made it I added a little extra flour (about 140g per cup) to compensate for the scoop and sweep method that I assumed the recipe was based on; and the last time I went with my standard 130g measurement. Both times were fine, but when handling the dough I could tell it wouldn't take much more. My suggestion would be to fluff the flour with a form and spoon it into your cup. What trauma those little people caused you--like a birth! It sounds like you used blackstrap molasses your first 'go round.' I did that once, too, last year when I made a gingerbread cake. Only I was really dumb, because the recipe just called for regular molasses and I thought: 'hey, I've always used the mild kind before, but I'll give the blackstrap a try." Ick! It's interesting that the recipe came from an old cookbook--on a recent NPR segment on molasses cookies, they mentioned that earlier in the century, people tended to like less sweet molasses cookies, and that 'original' recipes often tended to have an overly pronounced molasses flavor for modern tastes, which might be why the original specified dark (although that is still milder than blackstrap).